Bangladesh Air force Job Circular 2018 for the post of Flight Cadet. 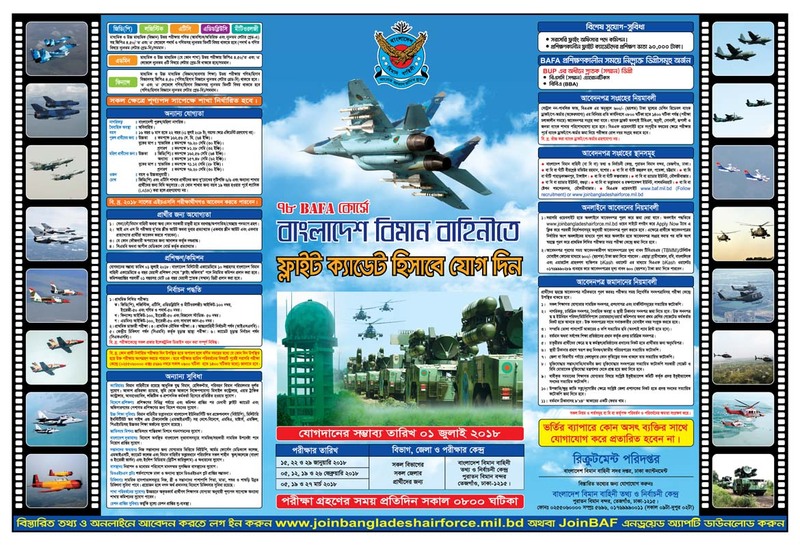 Bangladesh Air Force published a recruitment notice of 78BAFA course. Join Bangladesh Air Force and become an honorable of member of Bangladesh Air Force. Educational Qualification: SSC and HSC (Science) Mathematics of both (Compulsory/Optional and minimum later GRAD A) along with GPA 4.50/ for “O” level and “A” level must have minimum three subjects with Physics and Mathematics. Educational Qualification: SSC and HSC(any subject) GPA 4.50 / for “O” level and “A” level B grade in minimum three subjects. Educational Qualification: SSC and HSC (Science/ Business Studies) must have Mathematics / Accounting with 4.50 GPA. Age: 16 years and 6 months to 22 Years on 01 July, 2018. Height: Minimum 162.56 cm (64 inches). Eye: For GD(P) and ATC posts sight 6/6 and for other posts according to rules. Examination Time: Every day at 8 am. Division and District: For all Division and all Districts candidates. All kind of electronic devices are not allowed in the examination hall. For any kind of in formation about the Bangladesh Air force recruitment process contact with only official address given in the circular above. Keep visit to our site to get all kind of job circular, recruitment notice, examination notice at www.careerguidebd.com and don’t forget to like our Facebook page.